19/02/2019: Launch of a public consultation on draft guidance document on combating environmental crime. Anyone wishing to provide comments is invited to send them to ENV-E04@ec.europa.eu by 10 May 2019 using the following format and indicating in the email that the subject is “environmental crime”. Preparation of this guidance is one of the actions in the Commission action plan described below. Comments received by 8 March 2019 will be considered in the preparation of the final workshop under this action. More information is available here at CIRCABC. 11/01/2019: Launch of a public consultation on draft guidance on ensuring environmental compliance in rural areas (with particular reference to water and nature). Anyone wishing to provide comments is invited to send them to ENV-E04@ec.europa.eu by 5 April 2019 using the following format and indicating in the email that the subject is “rural areas”. Preparation of this guidance is one of the actions in the Commission action plan described below. Comments will be considered before finalisation of the guidance document. More information is available here at CIRCABC. 17/12/2018: Launch of a public consultation on draft documentation on complaint-handling and citizen engagement. Anyone wishing to provide comments is invited to send them to ENV-E04@ec.europa.eu by 15 March 2019 using the following format and indicating in the email that the subject is “complaint-handling”. Preparation of this documentation is one of the actions in the Commission action plan described below. Comments will be considered before the finalisation of the documentation. More information is available here at “CIRCABC”. 7/12/2018: the second meeting of the Environmental Compliance and Governance Forum took place in Brussels. Meeting documents and presentations are available at CIRCABC. The European Union has put in place rules to provide society with environmental benefits that include clean water, breathable air and a healthy nature. A recent Eurobarometer survey shows that an overwhelming majority of Europeans want the EU to make sure that these rules are applied across Europe. 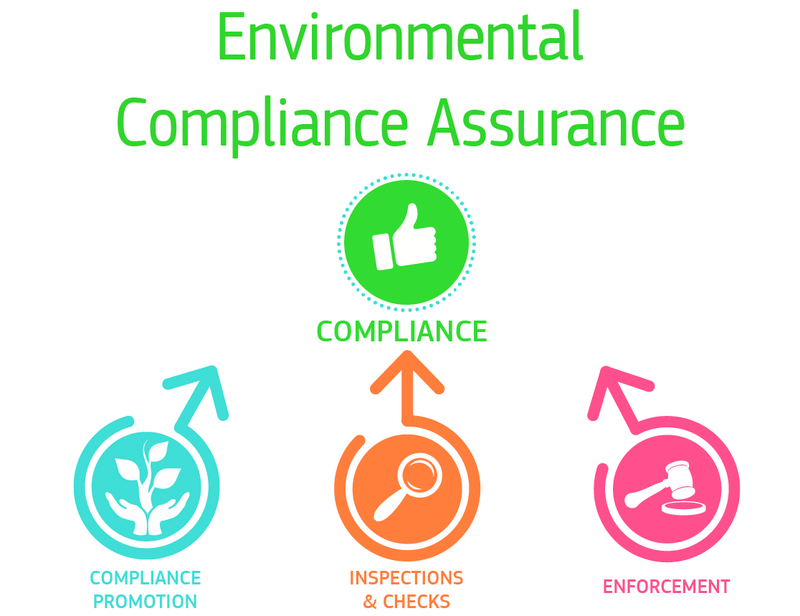 Environmental compliance assurance describes all the ways in which public authorities promote, monitor and enforce compliance with such rules. It is part of environmental governance. Enforce means stopping those who disregard the rules, sanctioning them and obliging them to rectify the damage. Promotion covers awareness-raising, guidance and advice. Monitoring covers routine environmental inspections, police investigations and environmental audits by public audit bodies. It also includes examination of complaints from the public. Enforcement covers audit recommendations, official warnings, cease-and-desist orders, administrative fines, criminal prosecutions and demands to take remedial action. Interventions may vary according to what works best. improve Commission information to Member States and practitioners. Delivery of the actions involves a newly established high-level expert group, the Environmental Compliance and Governance Forum. This will be a platform for exchanging views on how to increase compliance and improve governance generally. The inaugural meeting of the Forum took place on 13 March 2018. The second meeting of the Forum took place on 7 December. All documents relevant for the work of the Forum are available at the CIRCABC public library. European environmental inspectors, police officers, prosecutors, judges, auditors and heads of environmental protection agencies have formed separate networks to help them with their work. The networks enable knowledge, expertise and best practices to be shared. Environmental authorities and environmental inspectorates at central or regional level from all EU countries as well as candidate, potential candidate and European Free Trade Association (EFTA) countries. National police officers specialised in combating environmental crime. Bodies responsible for criminal prosecutions and, to some extent, applying administrative sanctions. Judges from across the EU responsible for criminal, administrative and/or civil cases. Supreme audit bodies. The working group functions within the more general network. European environmental protection agencies. BRIG is a grouping within the general network that takes a close interest in environmental compliance. In February 2017, the European Commission published for the first time an Environmental Implementation Review (EIR). 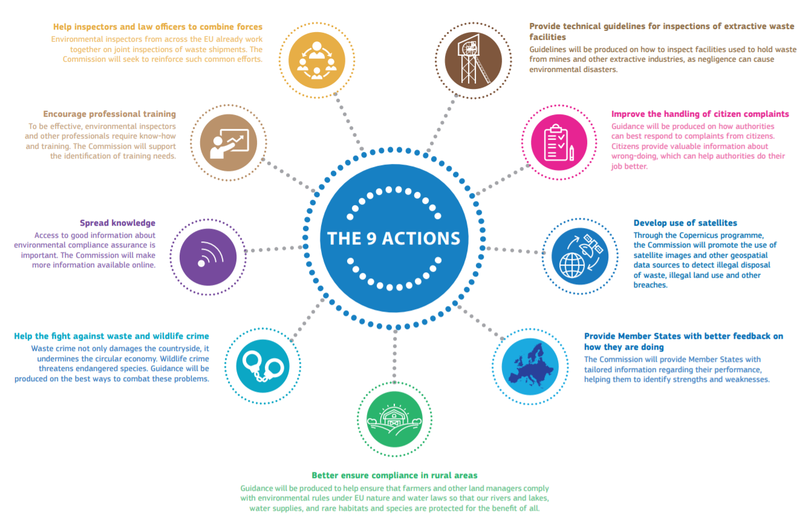 The EIR aims to improve implementation in the field of EU environmental policy, by trying to identify the causes of implementation gaps, and to find solutions to them. The first round of assessment reports for the 28 Member States revealed a lack of sound methodologies for assessing the various aspects of environmental governance. One of the actions in the 9-point Action Plan addresses this. A project has been launched with the main objective to develop a methodology for assessing the environmental governance performance of public administrations in each of the EU Member States. The assessment covers areas such as transparency, accountability, access to justice, public participation and effective administration. It links to global environment and sustainability governance initiatives, particularly the Sustainable Development Goals. Workshops took place on 27 February and 26/27 September 2018 and a final workshop took place on 24 January 2019. The final results will become available in spring 2019. Information meetings with stakeholders take place to discuss progress in the implementation of the Action Plan and on wider environmental governance issues and receive relevant input. The relevant documents are available here. Documents related to the 9-point Action Plan, including background studies, reports, and summaries of meetings and events. Updates are provided as the Action Plan is implemented. Newsletters have been issued at regular intervals to ensure transparency on the implementation of the Action Plan and other environmental governance related activities. The European Commission is keen to receive feedback on this subject matter. You can send any comments, questions or information of relevance (such as reports, projects, etc.) to us: ENV-E04@ec.europa.eu.